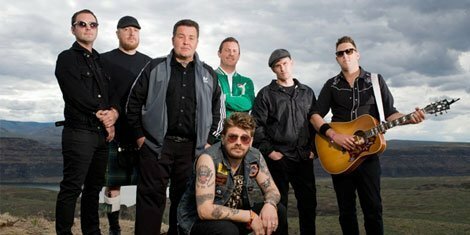 In the wake of the devastating bombings at the Boston Marathon, the Dropkick Murphys have raised upwards of $300,000 to benefit the victims. Almost immediately after the attack, the band announced the sale of special edition t-shirts which read "For Boston" on the front and "Thank you, to all who purchase this shirt. All proceeds go to the victims and families of the Boston Marathon Bombings. Love, Dropkick Murphys" on the back. Within the first 24 hours, the band raised over $65,000. The Murphys also played a benefit show in April featuring other Boston bands. Following that, singer Bruce Springsteen reached out to the band and offered his help on a special edition EP, also released to benefit the victims. Rose Tatoo: For Boston Charity EP was released on iTunes and features acoustic versons of "Don't Tear Us Apart" and "Jimmy Collins's Wake," and has Springsteen's vocals on a re-recording of "Rose Tattoo." The combined revenue from the sales of the t-shirts and EPs totalled more than $300,000 and will be doled out to the victims by the Claddagh Fund, a charity started by Murphys bass player Ken Casey in 2009. The continued sales of the merch will continue to raise money for the victims and their families.